Recently I was listening to a radio show I enjoy and the hosts were joking about “lost clicks” because they decided not to post a funny picture for one reason or another on their website. It reminded me of the way I used to think when I was blogging a few times a week. I was so concerned about how many pageviews I was getting (which was never all that impressive, anyway), that I lost focus of why I was doing this. But now I’ve had the luxury of distance. As building a house has demanded so much of my time, I’ve had to let go of blogging on a regular basis. Part of me has been relieved. But part of me has been desperately missing writing what’s on my mind and heart. And, this weekend, I realized why. It’s not the lost clicks. Not at all. It’s the lost memories. For years I’ve been collecting small moments in the form of stories, lessons, and laughs. I remembered that, while I haven’t been blogging much lately, I have been keeping a casual list of moments I thought might be blog-worthy…just in case. So, in no particular order, here are just a few of the lessons I’ve learned lately. I hope they bring a smile to your face, too. Lesson #1: You know your kids have been hacking into your phone when the most frequently used emoji on your menu is the pile of poop. Lesson #2: It’s no fun being sick on your 10th birthday. But it is nice that each doctor you visit reminds you of brighter days by pointing out that you have sand in your ears, courtesy of a really great vacation a couple months ago. Lesson #3: I’m pretty sure Strip Poker was invented by the mom of two little kids who were — quite literally — playing a hot game of Go Fish. Lesson #4: I’m not sure what it says about our family when our 4-year old’s favorite song is Stressed Out. 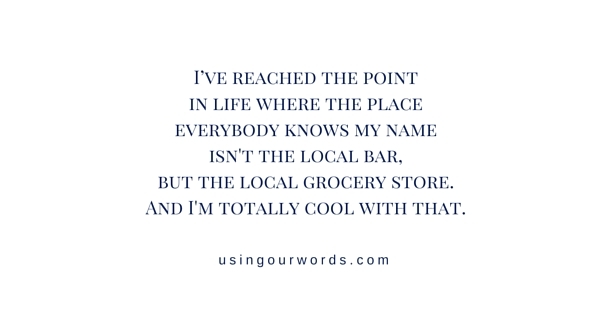 Lesson #6: I’ve reached the point in life where the place everybody knows my name isn’t the local bar, but the local grocery store. And I’m totally cool with that. Lesson #8: When you hop in an Uber and the driver hands you something insisting that you give it a good, long sniff, you start thinking you should have spent a bit more energy focusing on your will. Lesson #9: If you’re wondering how much bacon you need to prepare for breakfast when a few 10-year-old boys spend the night, rumor has it, you’ll just squeak by with three pounds. Lesson #10: If you’ve got a kid who turns everything she says into a song, you’ll quickly discover nothing really rhymes with “toilet”. Lesson #11: I can’t help but think it reflects poorly on me when, given all of Pink’s lovely belongings, she chooses a Happy Meal toy for share day. Lesson #12: The really upsetting thing about getting old is realizing you sang all the words wrong as a kid. • Trying to figure out where the instructions for how to get glue out of Pink’s hair fits in best on my “While We’re Away” doc for my in-laws. • A woman with grown children stopped in the grocery store to tell me that watching Little and Pink giggle and wiggle their way through the store brought her to tears. Funny, me too. Just imagine if we all approached this day with the heart and confidence of a 4-year old! • I’d like to give every mom and dad helping their California 4th graders build a mission a high five. But let’s face it, the likelihood that we’d become permanently stuck together makes it too damn risky. • If you’re looking for me, I’ll be in Pink’s preschool class for the foreseeable future. You know, the place where an extremely astute (if I do say so myself) 4-year-old girl continuously tells me how nice and pretty I am. • When my kids come down from this Easter’s sugar high in 2018, it’s gonna be ugly. • Kudos to the elementary schools that gave kids April Fools’ Day off (including ours). The joke is on the parents, for sure. • I’m sure the Giants’ Opening Day game was exciting, but I heard the Star Spangled Banner and saw boys throw a bunch all from the comfort of my very own dinner table. Same-sies, I’m thinking. Thanks for swinging by Using Our Words. Now get out there and do something that will make sand fly out of (or stick to) your body parts!